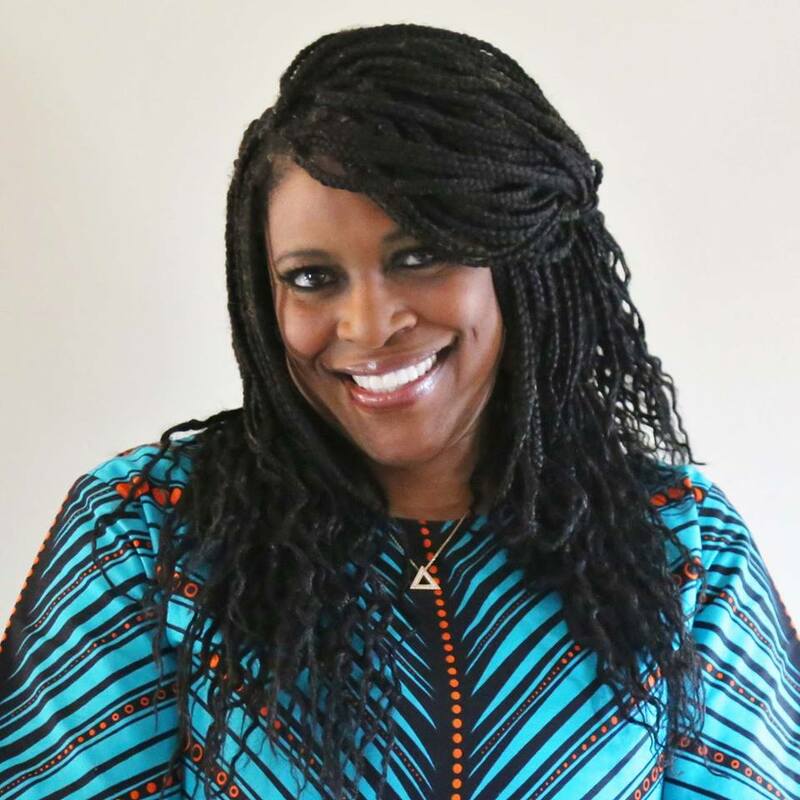 CARBONDALE, Ill. — Illinois NAACP State President Teresa Haley will speak and numerous other special events are planned as Southern Illinois University Carbondale celebrates Black History Month in February. 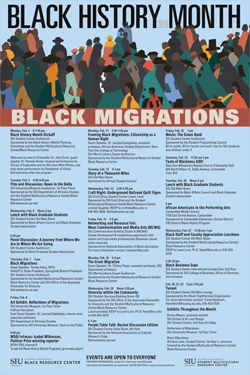 “Black Migrations” is the theme for the commemoration and all events are open to students, faculty, staff and the community at large. The vast majority of the happenings are free. The Black History Month Kickoff event is set for 6-7:30 p.m. on Feb. 4 at the Student Center Auditorium. SIU Chancellor John M. Dunn will offer opening remarks and the event will feature a musical performance by Matt Wilson, an SIU alumnus. Pamela Smoot, history assistant professor, will speak about “The Great Migration: Black Churches, Black Women and the National Urban League.” In addition, Gentlemen of Vision, comprised of talented St. Louis area high school students, will perform a step show. See “Down in the Delta,” the acclaimed 1998 dramatic film, at 4:30 p.m. on Feb. 5 in the University Museum Auditorium, located on the first floor of Faner Hall. Directed by Maya Angelou, the movie stars Alfred Woodard, Al Freeman Jr., Loretta Devin, Wesley Snipes and Esther Rolle, in her final film role. The tale follows a family’s migration from the south northward and then back to the south. A silver candelabra, a family heirloom, is symbolic of the generations within the family, as they move and endure, despite the struggles they encounter along the way. A discussion will follow and refreshments will be served. Haley, who also serves as president of the Springfield NAACP, will share her insights about black migration at 5 p.m. on Feb. 7. The keynote will be held in the Student Center Auditorium. It wasn’t easy through the years for African Americans to leave their homes and migrate to other parts of the country and search for better opportunities. Tiffany Player, assistant professor in the history degree program, will highlight some of the personal and family stories of those who made tough choices in hopes of finding a better life for themselves and their families. Her presentation, “The Great Migration,” will be at 5 p.m. Feb. 18 at the John C. Guyon Auditorium at Morris Library. Success breeds success and that’s what the Black Business Expo is all about. Representatives from more than 15 successful black-owned businesses/vendors in the community will be in the Student Center’s International Lounge from 5:30 to 10 p.m. on Feb. 27 to meet with students and give them the opportunity to shop with local black businesses. Music and refreshments will be featured as well. Those attending the “Tunnel” experience, set for 5-7:45 p.m. nightly Feb. 20-22, will find out as they are immersed in an interactive experience giving them the opportunity to experience for themselves racism and problems that people struggle with each and every day. Participants will go through a series of specially prepared demonstration areas at the Student Center’s Old Main Lounge that simulate prejudice, racism and other biases and exclusionary behaviors. Many other special events are planned throughout February, including a showing of “The Green Book,” a reality-based comedy/drama about the unlikely friendship that develops between African-American pianist Don Shirley and his tough Bronx driver/bodyguard as they travel the segregated Deep South during a 1960’s tour. Guest speakers, diversity discussions and events, workshops, craft activities, a networking and resources fair and much more are planned. Find the complete schedule of events, and additional details, online. A series of special exhibits will also take place at SIU. Briana Mason, a graduate art student, will display her work in the Art Gallery in the second floor of the Student Center throughout the month and a first-floor window case display will focus on black migrations. In addition, the University Museum will showcase the exhibit “Reflections of Migrations” in February. 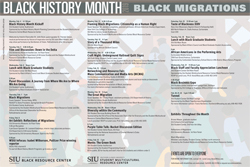 In addition, in recognition of Black History Month, an SIU faculty member is involved in special exhibits and discussions in neighboring states. “State of Triple-Consciousness,” a display of the artwork of Najjar Abdul-Musawwir, SIU art and design professor, will be held at the Clemens Fine Arts Center Gallery at West Kentucky Community and Technical College in Paducah during the month of February. The opening reception is Feb. 9 from 6 to 8 p.m. and Abdul-Musawwir will speak at 6:30 p.m.
His work is also part of a group exhibit at Kansas City Kansas Community College Art Gallery in Kansas City, Kansas. The exhibition, entitled “Good Negroes,” seeks to remind viewers of the racism and social issues still alive in America today. The exhibit opened in January and runs through Feb. 28. On Feb. 21 there will be a reception from 4-6:30 p.m. with Abdul-Musawwir and the other participating artists speaking at 5:30 p.m.
Black History Month is a collaborative, campus-wide celebration. Organized by the Black Resource Center and Student Multicultural Resource Center, its sponsors also include the Black Affairs Council, Black Graduate Student Association, Department of Africana Studies, Office of the Associate Chancellor for Diversity, SIU University Museum, Morris Library, African Student Council, Student Center, Craft Shop, Department of History, National Association of Colored Women’s Clubs, Student Programming Council, Carbondale Elementary School District 95, College of Business and its Office of Diversity and Inclusion, Black Togetherness Organization and the School of Art and Design. The Black History Planning Committee is likewise a synergistic effort with numerous student, faculty and staff members.